This morning, on social media, I admitted to being the White Privileged American granddaughter of a refugee twice over. My papou’s mother fled (with four small children) to Greece from the Catastrophe of Smyrna. Papou himself later fled to America* after the Nazi occupation of Greece. 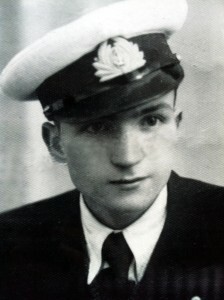 He served in both the Greek Merchant Marines and the US Army**. As he died before I was born, I never had the chance to meet my grandfather, but I am proud to be his legacy. After stating my dismay over the state of the world with regard to the current refugee situation, I announced that that was all I had to say on the subject, and then I went for a walk. During that walk I realized just how much more I had to say. Because I wrote a book about refugees, and no one noticed. 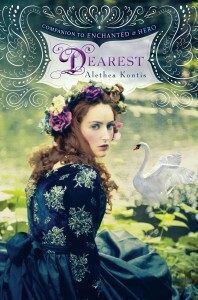 On the surface, Dearest is a young adult fantasy retelling of “The Wild Swans” (literally on the surface: just look at the cover!) starring the Mary-Suest of all white-girl Mary Sues, Friday Woodcutter. What Dearest is really about: Friday Woodcutter is the half-fey, half-human child of a mother who cursed her daughter by naming her because “Friday’s Child is loving and giving.” Friday is a gifted seamstress with a heart as big as the moon. As a poor woodcutter’s daughter compelled to fall in love with everyone she meets, she spends her days at the church, sewing clothes for orphans. She uses the scraps to make patchwork skirts for herself. They are a symbol of her love, generosity, and selflessness. When her sister Saturday breaks the world in Hero*** and calls the ocean inland, hundreds of families are displaced. Friday, who was also caught in the maelstrom, is rescued and wakes up back at the palace in Arilland. The king and queen have welcomed all the refugees into their kingdom. While it is a burden and a huge adjustment to their way of life, the monarchs take charge in a responsible manner. Based on Friday’s previous experience with orphans, the queen gives Friday the task of overseeing the children while the adults deal with the Very Adult Business of how to manage the sudden influx in population. Dearest has elements of “The White Swans” and “The Goose Girl,” but the plot is also heavily based on an Armenian folktale (released in picture book form by Robert San Souci and Raul Colón as A Weave of Words). In this folktale, a poor weaver’s daughter turns down a prince’s offer of marriage because he is lazy, illiterate, and has no trade. The prince gets off his duff and learns to both read and weave, gaining the daughter’s trust and her hand in marriage. In return, the prince (now king) teaches his wife (now queen) how to wield a sword and lead an army. The king is later captured by a malicious dev. He tells the dev he is a weaver, and proves it by weaving a cloth. He tells the dev it is worth a hundred pieces of gold, and that if he sells it to the queen, she will buy it. In the cloth, the king has woven a secret message. When the queen receives it, she picks up a sword and leads the army to rescue her husband. 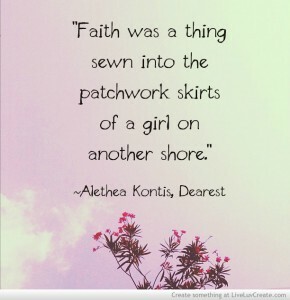 No spoilers, I promise: Just know that when I wrote the scene in Dearest where the Patchwork Army presents itself to Friday, I wept. Unsurprisingly, Dearest did not have much of a marketing budget. As a result, most of the reviews you will find online concentrate only on my “goody two-shoes” heroine and the reviewer’s knowledge (or lack thereof) of the dozens of fairy tales referenced in the text. To the best of my knowledge, NO ONE has mentioned the GLARINGLY ENORMOUS plot point about refugees. As Dearest was based on European fairy tales, Armenian folklore, and my own personal family history, I felt it was about time this was brought to everyone’s attention. My great grandmother, Theodosia Kontaridis (née Komnenos), was the direct descendant of the Byzantine Emperor Alexios Komnenos (his life was written into a 15-volume saga called the Alexiad). In September of 1922, when the Greeks and Armenians were forced out of the city of Smyrna (now Izmir), Theodosia’s husband was taken from her and killed on a death march. She was “allowed” to flee from her home with her sister, her wheelchair-bound mother, and her four small children. When they finally landed in Greece, after a harrowing adventure, Theodosia did what all smart refugee widows did in that era: she found a similarly widowed Greek man with one child and married him. The story of Theodosia’s flight is my family’s very own fairy tale. A few years ago, I wrote a picture book manuscript based on it called “Thea Maria’s Bag of Hope.” That manuscript remains unpublished. (Perhaps if I called her “Princess Maria” instead, it would garner more publisher attention.) I’ve thought about traveling back to Izmir, to the place where my family once lived, but according to my father (who made the trip several years ago) there is nothing left to see. My grandfather died before I was born, and I was too young to care about my own history before my great-aunts and uncle passed away as well. (Uncle Xanthos was a famous dollmaker and loved that I was born the year of the US bicentennial, so we usually talked about those things instead.) What Papou Stories I know were told to me by my Nana and my father, both consummate storytellers. My family survived Great Fires and Nazi Occupations. I am here because of them. I am the descendant of refugees. I wrote a book about refugees. I am proud of my book. I am proud of my family. I am proud of myself. 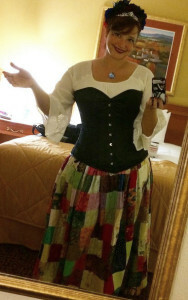 The patchwork skirts I wear for my appearances mean so much more to me than just a character’s costume. And the world should know these things. *Papou came to America illegally, which became a moot point after he served in the US armed forces, and is even more of a moot point now that he’s passed away. **He actually meant to be in the Navy, but his English was horrible. He turned left instead of right and ended up in the Army. He still eventually ended up working as an engineer on ships…but that’s another story. This entry was written by Princess Alethea and posted on November 24, 2015 at 11:18 am and filed under Dearest, Family, life. Bookmark the permalink. Follow any comments here with the RSS feed for this post.